Pepper was known to the ancient Romans. By the fifteenth century the demand for spices provided the impetus for world trade. America did not become a major player in the spice trade until 1797 when Captain Jonathan Carnes of Salem, Massachusetts returned with the first large pepper cargo from Indonesia yielding a seven-hundred percent profit for the ship's owners. He had traded directly with the Indonesians at Sumatra rather than with the Dutch colony at Batavia. Carnes also brought home "curiosities" which he gave to the newly founded East India Marine Society. Other merchants soon followed in Carne's wake and Salem became the center of the lucrative American spice trade. In March of 1839, Salem's government passed an Ordinance providing for the City Seal. The Council ordered a seal showing "A ship under full sail, approaching a coast designated by the costume of the person standing upon it and by the trees near him, as a portion of the East Indies; beneath the shield, this motto: "Divitis Indiae usque ad ultimum sinum," signifying "To the farthest port of the rich east"; and above the shield, a dove, bearing an olive branch in her mouth. In the circumference encircling the shield, the words "Salem Condita A.D. 1626" "Civitatis Regimine Donata, A.D. 1836." As an acknowledgment of the source of its wealth, the seal bears an image of a person in the traditional dress of Banda Aceh, the city at Sumatra's northern tip. Salem embraced the "East Indies" trade as a symbol of its prosperity and engagement with the world of commerce. The city seal is a literal illustration of how Salem saw itself: peacefully engaged in the mutually beneficial exchange of goods. Retire Becket built the ship Fame at his shipyard in Salem, Massachusetts. Becket built his finest and largest ships from 1797 to 1807 at the height of Salem's commercial prosperity Among them was the Margaret, one of the earliest American ships to call at Japan. The launching of a new ship was a festive occasion although Salem minister William Bentley noted that Becket "repeatedly failed" to smoothly perform this task. The complicated job of masting and rigging the ship was completed once the ship was floated. The Fame probably belonged to the Crowninshield family and went on to serve in the Baltic and East Indies trade. George Ropes was a local artist trained by Italian painter, Michele Felice Cornè, who had emigrated to Salem in 1799. Peabody Essex Museum, Salem, Massachusetts. At the close of the Revolution in 1783, Americans anticipated direct commercial relations with China as one of the main benefits of peace. Lengthy separations were a fact of life for families involved in maritime commerce. A trip to China and back often lasted as long as two years. Male family members shared their knowledge of exotic overseas destinations with female relatives in material form via gifts and souvenirs. The Chinese government confined all Western trade to a tiny walled compound known as hongs in the single port of Canton. The hongs comprised both warehouses and living quarters. Views of this commercial enclave graced numerous objects exported as souvenirs. By the second half of the eighteenth century, Chinese artists catering to the export market had developed a hybrid style incorporating Chinese landscape conventions (adapted from scroll painting) with fixed-point perspective adopted from western painting. Such depictions, topographic and factual, retained a certain exoticism, and appealed to western merchants' tastes. 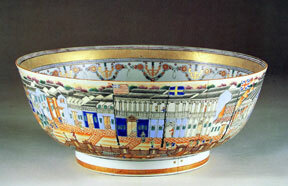 The earliest fans with Hong views date to around 1760 for British market. As the trade with America developed the Chinese began to target wares specifically to the American market and to add American symbols such as the flag to stock designs. Fans, portable personal items of fashion were often topical, and used to make personal statements. A fan such as this testified that a woman's near relation or sweetheart was an active participant in the lucrative China trade. Mariners imported these clay nodding-head figures "copied from life" to illustrate the people of Chinese for friends and family at home. Captain Benjamin Hodges presented the figure on the left, depicting a priest, to the Reverend William Bentley of Salem in 1790. Hodges, captain of the Salem brig William and Henry, had returned from Canton in May. Prior to the establishment of the East India Marine Society, many captains presented Bentley with foreign "curiosities" for his collection. Hodges also gave Bentley "a Pike or Spear of Wood, with a Bow & two Arrows brought by the American Ship Columbia from Nootka Sound" in British Columbia, & "Specimens of cloth from Sandwich Islands." The East India Marine Society was founded in 1799 with membership restricted to "persons who have actively navigated the seas beyond the Cape of Good Hope or Cape Horn." The Society's purpose was "to assist the widows and children of deceased members, to collect such facts and material as will tend to the improvement and security of navigation, and to establish a museum of curiosities." An early description  noted 185 articles including "images & paintings of Hindostan [India], China, & Japan, with complete dresses in the Chinese fashion.. . . Oyster shells of Sumatra . . . the Albatross" and tropical birds as well as antiquities and coins. By 1824 the collection had grown to nearly 3,000 items and the Society commissioned this building designed in the Greek Revival style by Boston housewright Thomas Waldron Summer. The first floor provided space for the Asiatic Bank and Oriental Insurance Office. The upper hall housed images, decorative arts, and artifacts from across the globe. The collection not only served to educate the public, but functioned as a display of the sea captains' and by extension, Salem's, global experiences. These objects, primarily from the East Indies trade, played key roles in reinforcing a new American identity and in articulating the relationship between American citizens and their international trading partners. The hall and its original collections are now part of the Peabody Essex Museum. Wood, silver trim, cushion upholstered in English Chintz, 108.5 x 79.5 x 460 cm. Calcutta, 1803. In 1803, five Salem sea captains purchased this palanquin in Calcutta, India for the East India Marine Society. The Society held annual processions in which the members, dressed in "oriental" splendor and carrying curiosities from the collection paraded through the streets of Salem. The palanquin, the donors suggested, would "gratify the curious, show the method of travelling and answer a very good purpose on festival day in case any accident should happen [to] a member." Palanquins, carried by human bearers, a familiar sight in Calcutta, were in Salem an exotic spectacle. In 1823, the Salem Register reported "a boy appareled in the most gorgeous habitments, borne by black-fellows. . . in East Indian dress attended by fan and hookah [water pipe] bearers and every other accompaniment of an East Indian equipage." Knowledge of the these distant lands and peoples, however limited or distorted, was transmitted by these live reenactments and the Society's collection and also by the commodities and goods flowing across Salem's docks -- spices and food items, raw materials, textiles, ceramics and art objects. Adapted from Susan S. Bean, Yankee India (1997), p. 79-80. Early 19th century. Artist not identified. North Island, New Zealand (Aotearoa). Kauri wood (Agathis australis). Gift of Captain William Richardson, 1807. Peabody Essex Museum, Salem, Massachusetts. Captain William Richardson was one of a few Salem captains to sail as far as New Zealand and Australia. In 1801, he initiated Salem's trade with Fiji. Much of this South Pacific trade was motivated by the search for goods that would appeal to the Chinese such as seal skins. The earliest European settlements in New Zealand were sealing camps. There, American and European mariners encountered the Maori, who had settled New Zealand in about 1000 AD. The earliest Maori artifacts were brought back from Captain Cook in the years 1768-1780. These curiosities attracted much public interest when they first went on display in 1803 at the British Museum. This pare or door lintel from a Maori meeting house was given to the East India Marine Society only four years later. The meeting house and the complex of which it is a part (marae) is the center of community life. The Maori meeting house represents an ancestor - the gable is his/her face and the roof ridge their backbone. To enter the house is to enter symbolically the body of the ancestor. In the middle of this pare we see a female ancestor figure carved with moko [i.e. tattoo-style designs]. The figure is not an idol, but a renowned ancestor of the tribe and thus is not religious, but secular. From the Maori viewpoint, the exhibition of taonga whakairo (ornamented treasures) is not a display of inanimate objects but of living beings with their own whakapapa (genealogy) and mana (power). Crowninshield Family Papers, Peabody Essex Museum, Salem, Massachusetts. Textiles were among the most expensive and valued of household and personal goods. Aside from tea, cotton and silk were the most important commodities of the East Indian trade. Prior to the Revolution these goods were available only through the British East India Company. At the time, the term East India refereed to the region that extended from India across Southeast Asia to China. Elias Hasket Derby had begun direct trade between Salem and India in 1788. In 1790 Derby's brig Henry brought a second cargo of "India Goods" to Salem. The opening of American trade with China and India greatly expanded the quantity and variety of fabrics available to American consumers as indicated by Derby's newspaper advertisement. As American merchants became familiar with these goods they began to order from samples which they gave to their shipboard business agent, known as a supercargo. Taffetas, a crisp and lightweight silk, available in a wide range of colors were primarily used as dress fabrics. They were famed for their glossy sheen which echoed the smooth shiny aesthetic qualities of porcelain, characteristics favored at the time. Broadside, Printed Paper, 28.6 x 24.1 cm. In 1797 Jacob Crowninshield of Salem brought the first Elephant to the United States from India. He sold it to New York promoters for $10,000 and they preceded to tour across the country. This broadside advertises the elephants appearance in Boston at the Columbian Museum. American spectators were fascinated with this living example of exotic India. Enos Briggs built the Friendship, a ship of 342 tons, in 1797 for a Salem mercantile firm. She is shown here flying the house flag of her owners Aaron Wait & Jerathmiel Pierce. Presumably they commissioned this painting from artist George Ropes to commemorate the ship's successful return home from China in August of 1804. Ropes shows the ship passing the Cape of Good Hope indicated by the profile of Table Mountain. The Friendship was the only Salem ship to trade in Canton during the 1803 season. Her voyage took her to the Malay coast, Sumatra, China, and the Isle of France (Mauritius). She returned with a cargo of nankeens (a durable brownish yellow cotton fabric), silks, pepper, coffee, tea and porcelain. William Story, captain of the Friendship, donated a model of the ship constructed during the voyage by ship's carpenter James Odell and second mate Thomas Russel to the East India Marine Society, now the Peabody Essex Museum. More recently a full-size replica was made and can be toured in Salem. The Friendship made fifteen voyages during her career to Batavia, India, China, South America, the Caribbean, England, Germany, the Mediterranean, and Russia before she was captured as a prize of war by the British Sloop of War HMS Rosamond in September 1812. Americans boasted of creating a republic based on equality and "allegiance to no crown," and championed the ideals of liberty and freedom. But they had competing and even conflicting visions of these concepts. In the north, freedom to trade and engage in commerce were paramount while the south promoted a agrarian nation of small farmers. In the early years of the republic, American sailors emerged as an important symbol of the spirit of the new nation. Fighting the pirates of the Barbary States and the War of 1812 created a rising spirit of nationalism and unity. The "WE OWE ALLEGIANCE TO NO CROWN" banner became a popular symbol of American pride during this period as Americans began to see themselves as worthy players on the world stage.